Top officials at the Federal Housing Finance Agency are being pressured to decide soon whether to impose discipline on Director Mel Watt, who is set to retire on Jan. 6 with full benefits, in response to investigator findings that he sexually harassed a female employee who complained of unequal pay. Attorneys at the nonprofit firm Whistleblower Aid, who are co-counsels representing employee Simone Grimes, wrote a pair of letters in mid-December to FHFA General Counsel Alfred Pollard and Human Resources Director Andrew Wasilisin arguing that the agency under the law has both a duty and a responsibility to act. They also sought “justice” for client Grimes as part of a broader bid to curb sexual misconduct in government. “Watt’s treatment of Ms. Grimes, and his public claim that he is above his own rules, are wrong, dangerous and illegal,” wrote John Tye, founder and CEO of the nonprofit, on Dec.12. Citing U.S. Code Title 5, Part 2635, the attorney said “your offices have the authority and the duty to discipline Watt,” adding that “relevant Senate staff counsel” have agreed that they have the unilateral authority. The story broke last July when Politico reported that Watt, age 72 and a former Democratic House member from North Carolina, had been recorded by Grimes making sexual comments about his attraction to her beginning in 2015, at a time when she had complained that she was being paid less than a male employee doing the same job. Her complaint focused on Watt having insisted that she meet with him at his beach house to discuss higher pay after a promotion, where some of the sexually oriented comments are said to have occurred. Grimes’s complaints—including one legal filing seeking $1 million in back pay and compensation in U.S. district court—prompted investigations not only by the agency inspector general, but an investigative unit of the Postal Service and by the Equal Employment Opportunity Commission. 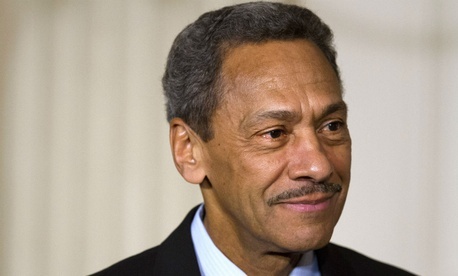 The press office for the agency, which oversees Fannie Mae and Freddie Mac, declined to comment. The IG did not respond to Government Executive inquiries. The scrappy group with an eye for public relations has also set up a “fire Mel Watt” petition and picketed the agency headquarters in November and December. As of Dec. 20, the petition had 2,403 signatures. The agency general counsel and human resources director should directly implement disciplinary action, Tye urged, faulting both the agency and Congress for failing to act. “The president has the unilateral authority to fire Director Watt,” he added, and as a Senate-confirmed official, Watt could be impeached.